Three Manchester academics have collaborated to produce a new book charting the history and development of the city. Manchester - Mapping The City chronicles the defining moments, historic events and rapid growth of Manchester, from the cotton trade in the late 18th century to the present day. 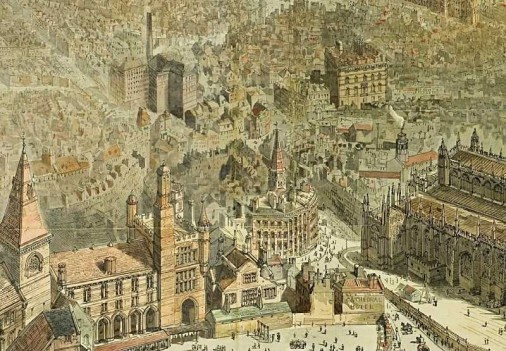 Published by Birlinn this month, Manchester - Mapping The City features more than 100 colour illustrations, shedding light on many previously unpublished resources, uncovering the story of the first industrial city. 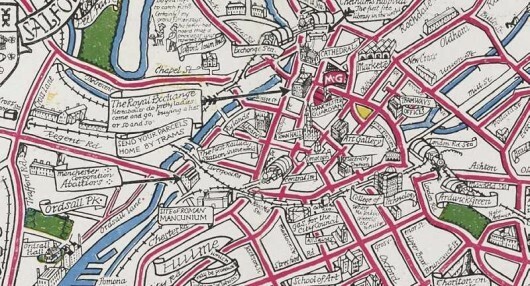 One of more than100 historical maps featured in Manchester: Mapping The City. Ahead of their talk at the Portico Library in December, authors Terry Wyke, Professor Brian Robson and Dr Martin Dodge spoke to The Northern Quota about the book. ''It’s a book driven by visual images’’, said Martin, a senior lecturer in human geography at the University of Manchester. Co-author Terry Wyke, research fellow at Manchester Metropolitan University stressed the educational value of such resources. ''I have had a long interest in the history of cartography, an interest that was sharpened in seeing how historical maps helped students develop an understanding of different cultures and issues in the past,’’ he said. The book charts the radical change brought about by the transport revolution. Some of the resources the co-authors found took them by surprise. One such example is the ‘cab fare’ map, discovered in the British Library. 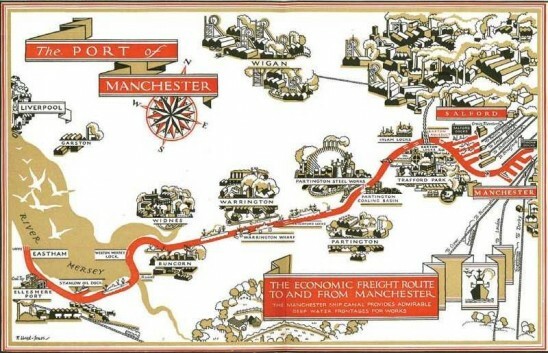 Unearthed by Brian Robson, emeritus professor at the University of Manchester, the map was created by cartographer Llewellyn Syers and has since been nicknamed the ‘Uber of 1868’. ''Cab maps were an attempt to help people calculate the likely fare for a journey in the days before the taximeter was invented at the end of the 19th century’’, Professor Robson said. Alongside great innovations and growth, Manchester: Mapping The City reveals some of the darker aspects of the city’s development. ''History is created by the powerful,'' said Martin. ''The documents that remain are those that show the wealth and transformation of the city as opposed to the poverty and struggle’’. Many of the images are previously unpublished resources. Writing a book driven by events rather than people, Martin acknowledged the tendency to ‘focus on the triumphal regeneration of the city’. ''I pushed for the last map in the book to be the divided city, showing the rich and developed city centre alongside the homelessness and poverty,’’ he said. Professor Robson cited poverty as one of Manchester’s biggest challenges for the future. Even in the face of these issues and recent tragedies like the Manchester Arena bombings in 2017, Robson says the future looks hopeful. ''Manchester has constantly shown itself ready to turn tragedy to advantage, and looking back at the ups and downs of its remarkable history does provide a story in which its citizens can take great pride." The authors will be giving a talk at the Portico Library on 5 December.